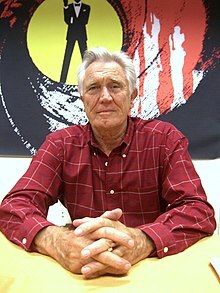 George Robert Lazenby /ˈleɪzənbi/ (born 5 September 1939) is an Australie actor an umwhile model, best kent for portrayin James Bond in the 1969 film On Her Majesty's Secret Service. ↑ "George Lazenby biography". New York Times. accessed 4 June 2011. This page wis last eeditit on 23 Februar 2015, at 19:17.